Glospey Computers is happy to announce that we will be offering Home Theater setup / installation services. When it comes to experiencing movies and tv shows, sound can play as much of a role as picture quality. A good pair of speakers can provide immersion, enhance the clarity and audibility of voices, background noises, and more. Modern TV's can display spectacular detail but often lack substance when it comes to the built-in speakers. 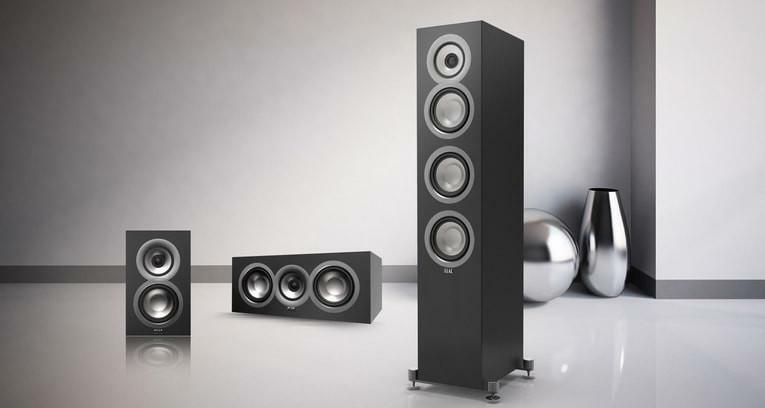 If you want to have the most immersive film experience possible at home, a set of dedicated speakers is a must. Whether you want a compact sound bar for your TV, a full-blown surround system for theater-level immersion, or a pair of bookshelf speakers for crystal-clear music in an office or bedroom - Glospey Computers is "hear" to help! Let us provide you with options for all of your HiFi needs. We can assist with sourcing, installing, and configuring your new speakers so that you can simply enjoy the experience. 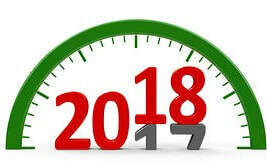 Glospey Computers is happy to announce our 2018 Winter Sale! We all rely on technology to comminucate, do business, and organize. Especially around the holidays, we rely on our tools to help coordinate family gatherings, shop online, and schedule this busy season's activities. When our technology misbehaves or gives out it can create stress, slow productivity, and cause frustration. In times like these, it helps to have someone you can rely on to get you back up and running. This year, give the gift of Peace of Mind to someone you know. 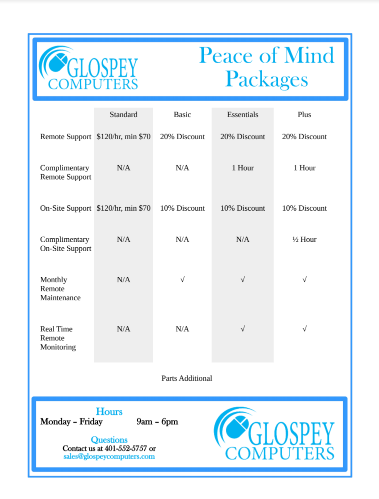 With multiple tiers of service ranging from basic remote support to professionally managed security solutions, Glospey Computers Peace of Mind packages make a great gift. From instruction to diagnostics and repair, Glospey Computers is open 7 days a week and we are here to help with all your technological needs. 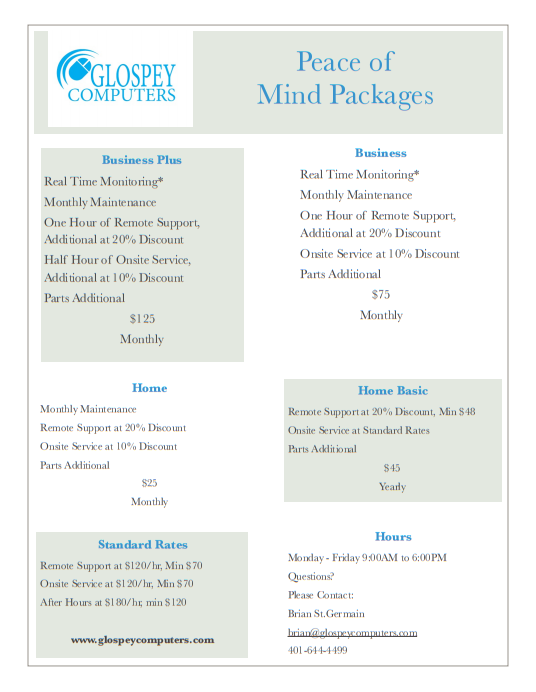 Between December 12th and January 31st, 2019, Glospey Computers will be offering 10% off of any of our Peace of Mind plans as well as a free month of service with every year subscription. This includes our existing PoM packages for those who would like to extend their coverage. 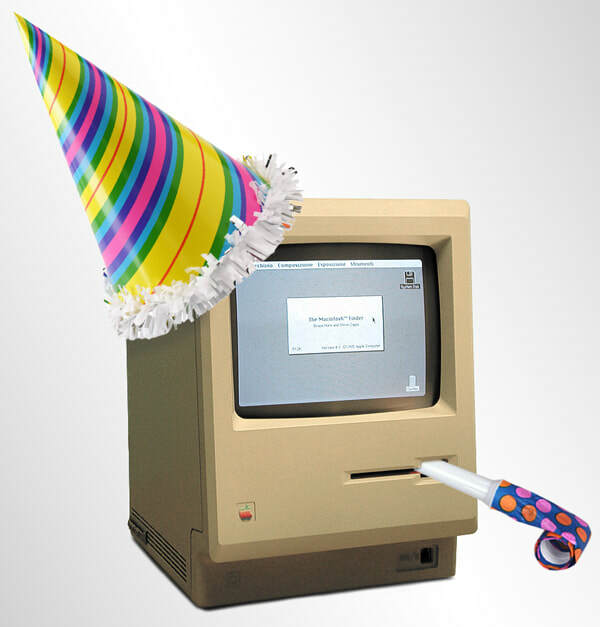 Happy Holidays from all of us at Glospey Computers! Did you get your loved one a new laptop for Christmas? Why chance giving them an incomplete gift? Be sure that the tech you gift this season is out-of-the-box ready with the proper antivirus, firewalls, and security. We don’t like to sound gloomy, but anything that is connected to the internet is at risk of being infected with some pretty nasty stuff that hackers have cooked up. Especially if you have made your home a ‘smarthome’ with heat, music, or tv controlled by a device that connects to your laptop, you may unwittingly be inviting access to your network and the sensitive information that is on your computer. One of the biggest pieces of advice we can give to everyone (pretty much all year, not just during the holidays) is to make sure that you connect to the internet using a router that is password protected and secure. 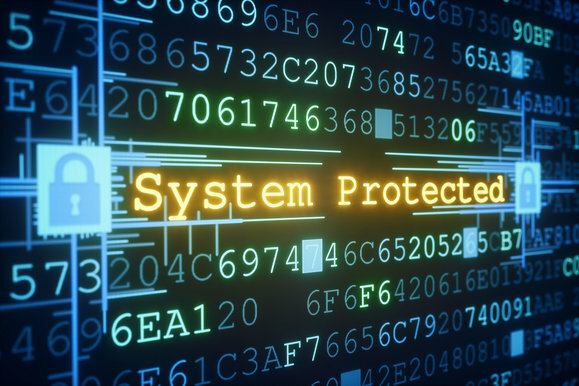 Unsecured network use is inviting the bad guys right into the system. If you are purchasing a laptop for student or for your non-tech-savvy parents or grandparents, then an extra could be to gift them with a good wifi router. And, if you need to set up accounts or passwords for them in an unsecure environment before hooking up a new router, using your cellular service to access the internet should be a safe choice. Also, if an older router is being used, it should be a replaced with a new one. Make sure that new laptops have the right antivirus protection. We are always available to advise you and give you recommendations on the best current software to keep viruses at bay. . Setting up accounts with strong passwords is a HUGE defense against the dark artists known as hackers. We think it goes without saying that we suggest not using ‘password’ or ‘1234’ as your password. Passwords should be a combination of letters, numbers, symbols and upper and lower case letters. If you are worried about keeping track of passwords...a nice notebook is the perfect low-tech solution to keep organized. Once the new laptop or device has been unboxed, be sure that needed device updates are installed right away. These updates will more than likely include security patches that will address new problems that have arisen since device manufacture. 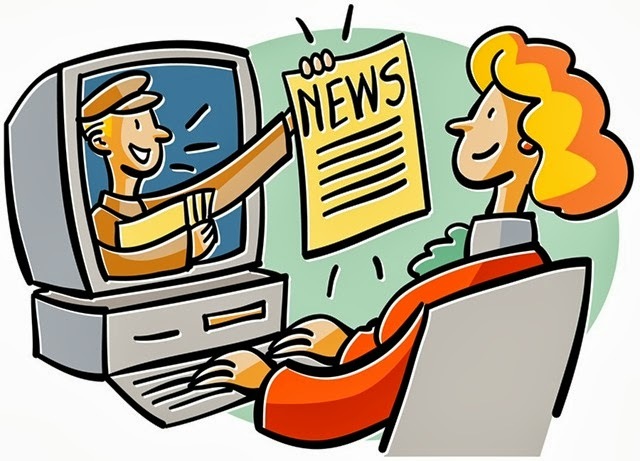 Want us to handle the installing of the antivirus or other safety measures discussed here? No job is too small for Glospey. 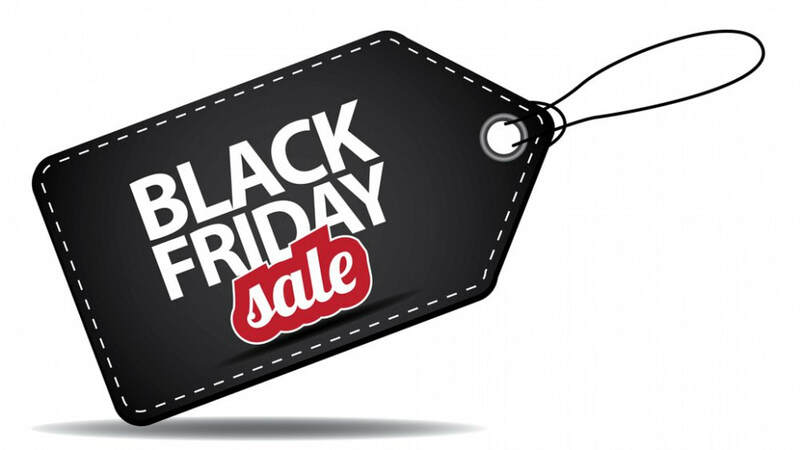 Give us a call so that we can help make your holiday a happy, hacker-free one!